To be a travel writer and have a souvenir compulsion seems too on the nose, like a pastry chef with an insatiable sweet tooth. Sure, the two go hand in hand, but one would assume a certain amount of professionalism, some intellectual distance between the career and the infatuation. But alas, here we are, and as I type this I’m wearing an Angkor Wat t-shirt, moccasins from a Native American trading post in Wisconsin, and a scrunchie from the Atacama Desert in Chile. It’s true, I love souvenirs of all kinds. Throw me in an overseas airport, a national park rest stop, or a rural flea market and I’ll find something to buy. Mention the word “handicrafts” and I begin to salivate (Where? How much cash should I bring? Can you get an extra suitcase in this town?). Swing by my LA apartment and you’ll find enough tchotchkes to make a grandmother weak in the knees. A flashing Christ the Redeemer statue from Brazil, a figurine of a kitten resting on a sushi roll from Japan, a hand-carved wooden sloth from Peru – my home is a veritable U.N. of trinkets. I may be the only person who can return from a funeral with souvenirs in hand. I’ve done it twice now, I’m only slightly ashamed to admit. The first time was at a service for a friend’s dad. She set out his collection of crosses – all small enough to fit in your hand, some carved from wood and others cast in metal and studded with stones – and told well wishers to help themselves to his treasures. I obliged, of course. The second time was just last weekend. I drove down to Long Beach to support a different friend whose mom had died. After the funeral, I decided to mark the day with a visit to a nearby antiques shop I had long admired on Instagram. There, I bought an oddly-shaped, oblong purse* from the 1960s, plus three vintage postcards. The purse is one thing (doesn’t every self-respecting woman need a floral bucket bag coated in what feels like placemat laminate? ), but the postcards are another. To purchase souvenir mail for places I’ve never been with messages by and to people I’ve never met, is a bit like buying someone else’s memories. But wrap them up and charge my credit card – I’ll take ‘em! *Note: on further inspection, my “purse” might actually be a flour canister with a handle. For me, the ritual of shopping is thrilling – from the hunt, to the small talk with the store clerk (“Yep, just visiting! Jet lag… boy, tell me about it!”), to the payment (in Japan, they pass your change on a little tray, always doing so with both hands). But the lugging home might be my favorite part. Some people get an adrenaline rush from SoulCycle; I get mine from packing a bag full of souvenirs. I once ran the New York City marathon, but if I’m being totally honest, I got more of a runner’s high from sprinting to my terminal in Marrakech with six bottles of argan oil, two rugs, a silver tea set, and a silky pair of harem pants crammed into my suitcase. When I touch down at LAX, it’s often my boyfriend who picks me up. He is a minimalist, which means two things: 1) I am a monster in his eyes and 2) I’ve become accustomed to the look of terror on his face when he spots me charging through baggage claim with my latest finds. “Good news!” I’ll shout to him as I maneuver my luggage trolley around one exhausted family or another. “I found a four-foot loofah at a market in Tel Aviv!” He has suggested I read Marie Kondo’s The Life-Changing Magic of Tidying Up on multiple occasions, but I’m not interested. If she opens a museum devoted to cleaning, I’ll swing by the gift shop. Otherwise, I’m good. My job enables my souvenir obsession to some extent, but not as much as you’d think. Sure, I’m fortunate to visit incredible places around the globe, but most travel writers don’t buy a fraction of what I do. Media trips are jam-packed with hotel showarounds, meet-and-greets with local business owners, and extended meals with publicists who want to make sure you understand why their destination is the “it” place. There’s very little solo time, and if you do get an hour to yourself, rather than reaching for your wallet, you’re probably grabbing your laptop to file a story or email an editor. All of this to say, most journalists don’t regularly return with a souvenir haul, so the fact that I do is something of a feat. On a recent press trip to Cabo there was absolutely no opportunity for shopping. But low and behold, I found a lucha libre sleeping mask at the airport on my way out of town. God forbid I should leave without at least one memento (and the opportunity to look like a luchador while I snooze). Speaking of Mexico, I’ve always preferred the Spanish word for souvenir. It’s recuerdo, which comes from the verb recorder, to remember. This makes shopping sound like a noble pursuit, an artform really. Tell someone you’re obsessed with souvenirs and they’ll call you a hoarder; but mention that you’re a memory collector and they’ll nominate you for a humanitarian award…or at least curb their judgement of that shot glass you’re buying. Here’s where one theory about my souvenir obsession comes in: maybe the mementos are a way to freeze time, to have something tangible to hold from an instant of joy and discovery, no matter how brief. In the face of all that feels fleeting – the trips that come and go, the people we lose along the way – maybe the tokens are how we capture a little of that magic and keep it with us. This theory is more convincing when I’m looking at something like the book of poetry I brought back from Singapore, less when I spot the stickers of dancing turds I also bought on that trip. But lately, I have a different theory: maybe the souvenirs aren’t always about the past, but sometimes about the future – an effort to capture the people we hope to become. In the same way that we imagine an ideal vacation self before a trip (I’ll definitely do yoga each morning… I’ll basically just eat fresh fruit and seaweed… Will three novels be enough for my four-day getaway? ), the things we bring back might be something of an idealization. That would certainly explain the Frida Kahlo tortilla warmer I bought in Mexico City, my set of zodiac sake glasses from Tokyo, and the frog-shaped napkin rings I got in the Amazon (oh yeah, I found unnecessary tabletop decor in the wilds of the jungle). I have nothing more than a bistro table in my apartment and have never hosted a real dinner party. But, I might one day. My traveling self thinks so. The clothes I buy on the road are also reflective of this type of wishful thinking. The ponchos, straw hats, batik jumpsuits, kaftans, kimonos, and cowboy boots I’ve wrangled from around the world don’t get a ton of use now that I’ve got them home. But, I wish I was the kind of person who wore them all. On further reflection of my post-funeral souvenir purchase, I do see in that purse/flour canister an exploration of who I’d like to be. I never met my friend’s mom, Helena, before she died, and actually, I’ve only known my friend for a matter of months. She’s also a travel writer and we met on a press trip. During those few days away, my friend got the call that Helena’s cancer had spread. That hellish revelation bonded the two of us in a way that’s not typical of a work trip. At the funeral, I sat in the back, alone – a tourist to a life I wasn’t part of. Helena’s family and friends told tales of the woman she was: an immigrant from Finland, a champion of women’s rights, a fashion and crafts lover, a voracious traveler. Maybe that’s why, just an hour later in the antiques shop, I picked up the purse. As I held it to my side and stood in front of a mirror, I thought to myself, “Helena would love this.” I knew I had to have it – a souvenir for a life well lived. 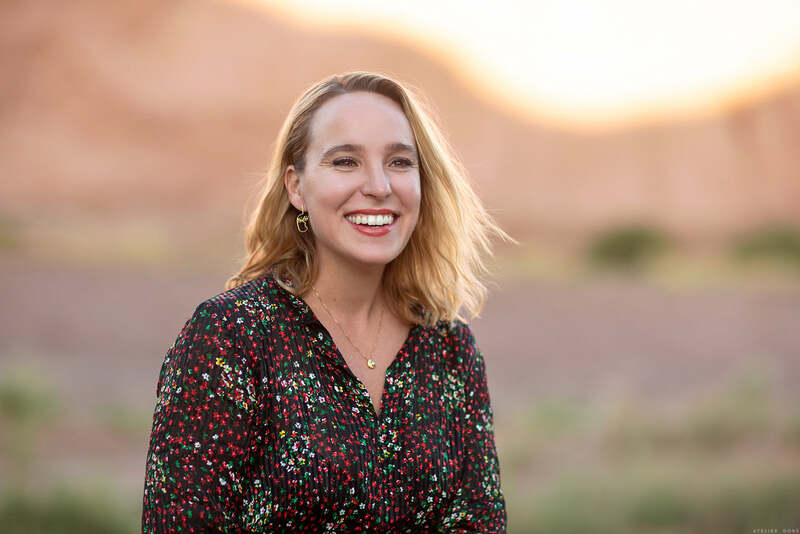 Amelia is a travel writer who has contributed to Travel + Leisure, Harper’s Bazaar, Los Angeles Magazine, Fathom, and National Geographic Traveler. She accompanied us to our Art of Self Discovery retreat on behalf of Mr and Mrs Smith, and obviously we fell head over heels in love with her. Expect more of her witty and kind writing to appear on the site! And if you want to know what she bought in Chile, here’s the rundown: three books from that middle-of-the-desert bookstore, patchwork pillow covers, two pairs of copper earrings, an Atacama tote bag made of felt, a handmade penguin hat, chocolate candy called Cat Tongues, bath salts made from local chañar berries, llama socks, two scrunchies (swayed by their startling fashion comeback), a straw purse, and a tie-dyed kaftan. So not that much, if you ask her. Dear Amelia – souvenir comes from the French word “souvenir” which means remember. A souvenir is as much a memento as recuerdo. Enjoyed reading your text though. Ah touché, Anuket! Spanish has always been more familiar to me than French, but happy to know that “souvenir” in itself denotes memory. Thank you so much! In your last sentence “A SOUVENIR for a life well lived”, could you change one word: A PROOF for a life well lived ? “Yep, just visiting!! !” or I say, “Just browsing!” Then, I get home– “Let’s check out my loot.” Simply an exciting event. I enjoyed reading this. Just love people like you…for being you.